After he immigrated from Libya to the U.S. in 1978, Mohamed Bzeek and his late wife, Dawn, made an admirable decision: they would intentionally foster terminally ill children. The two started helping kids together in the late 1980s, and by the mid-1990s they decided to focus exclusively on terminally ill children; Dawn died in 2014 after experiencing her own health woes, leaving Bzeek to continue his work alone. Now, Bzeek is a single foster dad who works to make sick kids’ lives as good as they can be — and it’s no easy task. Over the past two decades, Bzeek has watched at least 10 of the children he has taken in die, and he’s currently caring night and day for a 6-year-old girl who suffers from encephalocele, a rare brain defect. As a result, she is deaf, blind and paralyzed, and spends 22 hours a day on a feeding tube. In the end, he told the Los Angeles Times that he simply wants the child to know she’s not alone. His kindness has distinguished him in the eyes of officials with Los Angeles County’s Department of Children and Family Services, as Bzeek is the name that always comes to mind when the agency is faced with a terminally ill child. In speaking with the Times, Bzeek said the key is to love the children like their his own, noting that it isn’t an easy process dealing with the profound loss that accompanies caring for these kids. Bzeek’s love for the little girl he cares for is profound, with the Times showcasing how he cares for her, holds her and comforts her when she is in distress. In early December, he held a birthday lunch for her sixth birthday. “Yay! You are 6!” he said, holding the cake up so she could see it — just one of the many examples of how Bzeek works diligently to bring normality and love to the lives of children who desperately need it. Read more about Bzeek’s story here. 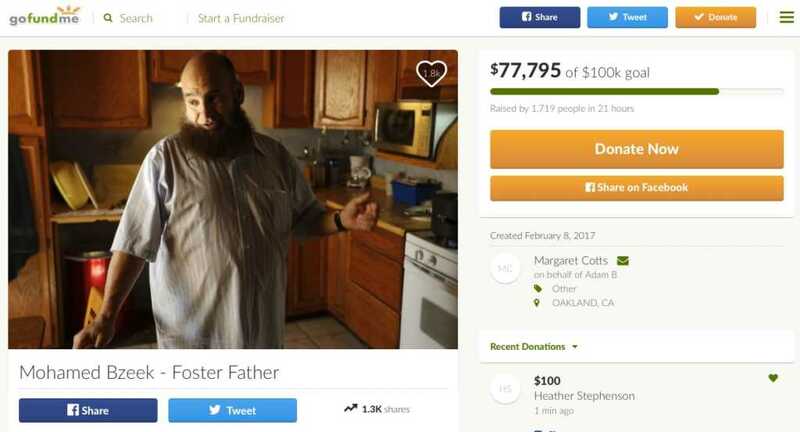 A GoFundMe account to support Bzeek has raised over $77,000 in the past 24 hours. It should also be noted that Bzeek kept up his inspirational work even after his own son, Adam, was born in 1997 with brittle bone disease and dwarfism.